Sek Me Choy is a restaurant that serves Bak Kut Teh and various of other dishes as well.Tried their Bak Kut Teh that have a flavour of pepper so its slight spicy, i love it. 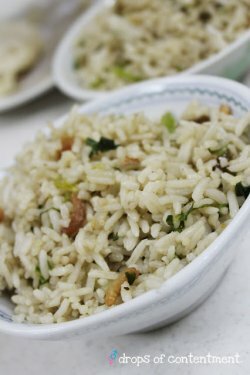 The rice they also have option of white rice the normal one or grain rice , flavoured rice of vege. Tried their asam fish also not bad at all, the fish is fresh and the vege too. 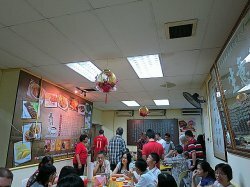 Wanted to try some special Bak Kut Teh , this is the place! 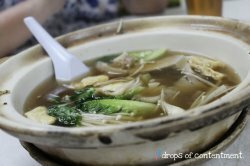 Sek Me Choy is a restaurant that serves Bak Kut Teh and various of other dishes as well. Tried their Bak Kut Teh that have a flavour of pepper so its slight spicy, i love it. The rice they also have option of white rice the normal one or grain rice , flavoured rice of vege. Tried their asam fish also not bad at all, the fish is fresh and the vege too. Wanted to try some special Bak Kut Teh , this is the place! 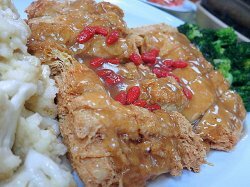 This no-frills eatery in Salak South is dishing out decent deals for the Chinese New Year season, feeding congregations of ten for RM324 nett (without tea). SekMeChoy's signature bak kut teh is the centerpiece of this set, with refillable hot broth. Distinctively peppery, awash with plenty of meaty-fatty pork belly & tail & bouncy intestines. Pak choy with fish maw. Nothing wrong with this, but it probably won't be remembered by the time the Year of the Snake slithers in. Bean curd skin with broccoli & cauliflower. Also more of a stomach-filler than a scene-stealer. 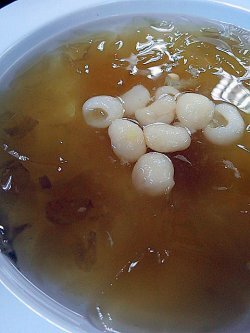 Lemongrass-laced jelly with lychee. A tropical herbal twist to the standard chilled dessert. Potentially an acquired taste, but refreshing all the same. 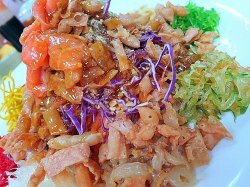 Reserve a slot in SekMeChoy's air-conditioned section (which has as few as five tables _ less than a quarter of the outlet's capacity) & raise your chopsticks for the salmon-jellyfish yee sang. 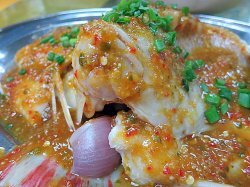 Spicy steamed tilapia, fleshy & flaky, with tangy tomatoes, stinging cili padi & crunchy shallots. 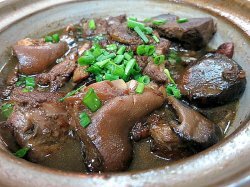 Pork shank with dried oysters & mushrooms. Deliciously emblematic of ingredient-driven Oriental cooking, thanks to meat & accompaniments braised to sumptuous succulence. 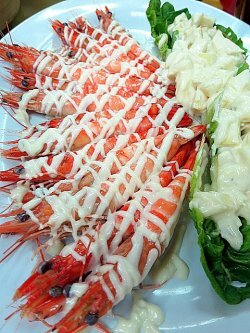 Prawns served cold with pineapple salad. Gorgeously presented & relatively healthy, but not the most pleasurable crustacean preparation. Steam them with rice wine or stir-fry them instead. 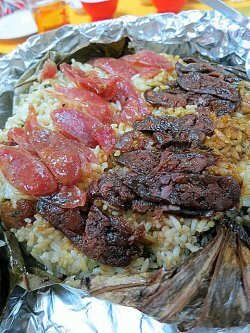 Lotus leaf fried rice with waxed sausages. Well-prepared, though the sausages are not as perfumed as the most intoxicating ones out there. But though the food at SekMeChoy is worth the visit, the REAL reason why I recommend this place is because of these Durian Rolls (RM 5)! 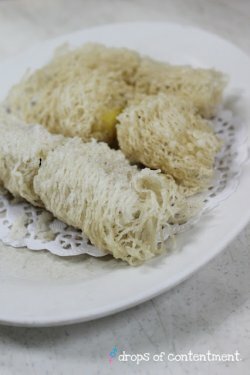 On the outside, all that is visible is the rice paper pastry, commonly found in some dim sum dishes (if you like, a Chinese version of kataifi filo pastry). But take a look inside, and you'll be greeted with the sight of yellow durian flesh oozing out of the pastry! 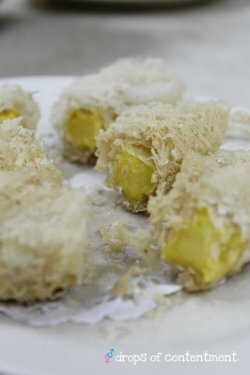 With the hot and crispy outer layer freshly fried and the durian inside kept at cold refrigerator-chilled temperature as you take a bite, this works out to be one of the best hot-cold yin & yang desserts in KL! 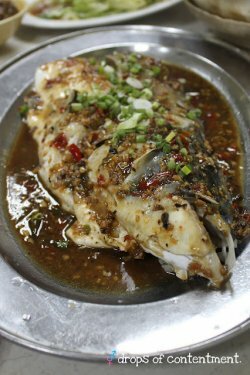 Fish Head (RM 26); not something we usually go for, but at SekMeChoy this is a dish that cannot be passed on. The name may suggest that it's just a fish head on a plate, but actually a lot of meat accompanies the head around the neck towards the body. This was cooked in a slightly spicy style, which was a good mix with the fresh fish flesh and with the other dishes we had. The flesh was also firm, signalling it was a fresh fish and not a frozen one as served by many restaurants. This also seems to be popular at SekMeChoy, the Rice with Mustard Cabbage (芥菜饭, RM 1.80 per bowl) which you can order in substitute of plain white rice. Their version of this dish contained shredded mustard cabbage, dried shrimps and Wendy said she tasted some orange rind in it as well. This was an interesting concoction, but will not fit everyone's tastebuds. I certainly didn't really enjoy it, but that's because I felt there was too much vegetables. There was a good portion of dried shrimp though, and it helped enhance the flavour of the rice. Overall, a very healthy suggestion. Duck with Ginger Slices (姜芽鴨, RM 9) is another specialty on the menu. 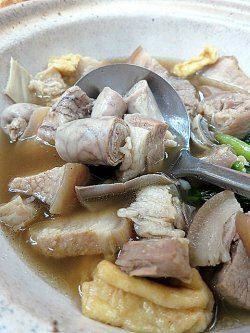 Although presented in a small-to-medium sized bowl and not in a very appetizing manner, I was most impressed by the taste and tenderness of this. 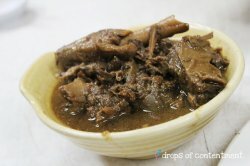 The duck was very aromatic, and blended well with the slight-but-not-too-salty gravy. We felt the flavour of duck went best with this dish, and changing it to chicken or beef would not have the same blend of flavour. SekMeChoy is meant to be famous for its Signature Peppered Bak Kut Teh (招牌胡椒肉骨茶, RM 19 for two servings), so naturally we had to give it a go. If I had to state the most obvious ingredient in this version of BKT, it would be pepper! This BKT had so much pepper inside it turned the soup into a flaming devil as it goes down the throat. Some may like it like that, while others might say that's not the way BKT is meant to be. I found it ok, although I didn't finish the soup for fear of a sorethroat. SekMeChoy is meant to be famous for its Signature Peppered Bak Kut Teh (招牌胡椒肉骨茶, RM 19 for two servings), so naturally we had to give it a go. If I had to state the most obvious ingredient in this version of BKT, it would be pepper! This BKT had so much pepper inside it turned the soup into a flaming devil as it goes down the throat. Some may like it like that, while others might say that's not the way BKT is meant to be. I found it ok, although I didn't finish the soup for fear of a sorethroat. =P The meat on the other hand was tender, with the pork falling off the bond. 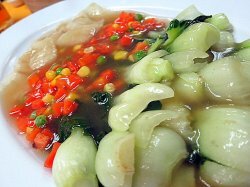 The vegetable was also juicy and tasted nice in the soupy broth.